Item to be imported is eligible as per import policy/Pass Book. LCAF is duly filled in & signed by the importer. Bank will endorse the value with particulars & equivalent Taka or Local currency of the Importing country on the back of exchange control copy of LCAF. i) (a) The LCAF set of 6 copies duly filled in and signed by the importer is to be submitted to the Bank with a forwarding letter. The branch, on receipt, will carefully scrutinize the same in details, verify the signature of the importer, and furnish the required particulars and information certifying the entitlement as per current Import policy under their seal and dated signature. The LCAF is entered into the relevant register and submitted to the Area Registration Unit of Bangladesh Bank directly under cover of a forwarding schedule in duplicate for registration. i) (b) The LCAFs are registered by the Bangladesh Bank Registration Unit subject to observance of usual bill. The officer-in-charge of the Bangladesh Bank Registration unit will give the Registration number on all the copies of LCAFs under his signature. Therefore, the same will be embossed with the security seal of the registration unit. No letter of credit will be opened unless an LCAF, which has been registered with the Bangladesh Bank, bears the impression of the security seal. i) (c) After registration the original and duplicate copies of the LCAFs will be delivered to the authorized representatives of the banks from whom the same were received by the Registration Unit. Triplicate and quadruplicate copies of the form will be passed on to the concerned licensing office. Quintuplicate copy of the form will be retained in the record of the Registration Unit of the Bangladesh Bank. i) (d) The customs copy is to be handed over by the branch to the importer, but Exchange Control copy is retained by the branch for further action at the time of opening L/C etc. the Exchange control copy of LCA form acts as the basis on which imports into Bangladesh is permitted, while the customs copy is required at the time of clearance of the goods from the customs on importation. ii) (a) In case of imports against barter/loan/aid etc. where registration of L.C. Authorisation forms will not be needed, the nominated bank of the importer will submit the form directly to the designated bank. The designated bank will countersign the form under their seal with date. The designated bank will retain the original and duplicate copies of the form and send triplicate and quadruplicate copies to the concerned licensing office and quintuplicate copy to the importer’s bank. ii) (b) The authorized Dealer branches will not issue blank L.C. Authorisation Forms to their clients. purpose of import by opening L/C. private sector importer is specifically exempted from IRC, LCA Forms shall not be accepted from him/her, or L/C shall not be opened in his/her favor without valid and legally renewed IRC. required to be registered- In case of import under Loan, Grant, Barter or special trade agreement, nominated bank after recording the particulars mentioned in the LCA Form shall forward the LCA Form or LC Application Form along with other necessary documents to the designated bank with the request to open LC. And then the designated bank, after opening L/C, must forward the third and fourth copies of LCA Form to the Import Control Authority within 15(fifteen) days. i) At the time of opening of L/C against a LCA form, full particulars should be endorsed on the back of the Exchange Control copy of the relative LCA form under stamp and signature of the authorized official of the branch. The amount of Taka equivalent of the L/C amount should be shown after converting the F.C amount into taka( or local currency of the importing country) at the ruling rate of exchange for ready delivery. ii) Details of remittances made whether under L/C or otherwise should also be endorsed on the Exchange Control copy of LCA forms together with the number of relative IMP form. i) The AD branch should in no case hand over the Exchange Control copy of LCA form to the Importer or their authorized agent. If such LCA is required by any other bank in connection with the opening of L/C or making remittances against imports or by the CCI & E for the extension, revalidation etc. the same should be forwarded to the Bank concerned or to the CCI & E directly by the branch. 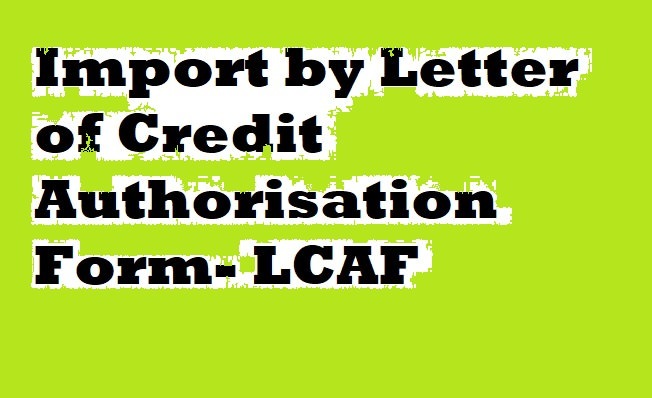 ii) Before forwarding the LCA forms to other Authorised Dealers of Licensing Authorities, Authorised Dealer branches should ensure that full particulars of all letters of Credit opened, and remittances made there-against are clearly endorsed on the back of the LCA forms and that the LCA forms will be resubmitted to them. LCAFs remain valid for remittance for 09 (Nine) months in case of commercial items and 17 (Seventeen) months in case of capital machineries & spares. i) Where a Letter of Credit opened against a valid LCA form is cancelled or expires partly or wholly unutilized or if the sale of foreign exchange against a valid LCA form is subsequently cancelled, the relative endorsement mode on the back of the Exchange control copy of the LCA form may be cancelled provided, appropriate remarks to that effect are made on the back of the LCA form under the stamp and signature of the Authorised officer. ii) In case where an endorsement has been made on a wrong LCA form by mistake, the Authorised Dealer may cancel the endorsement provided the endorsement is transferred simultaneously to the appropriate valid LCA form. It is not permissible, however, to transfer endorsements from valid LCA form to LCA forms, which have expired, although, such LCA form may show an unutilized balance sufficient to cover the endorsement. It is also not permissible to transfer endorsements from one valid LCA form to another valid LCA form unless both are identical in all respects.